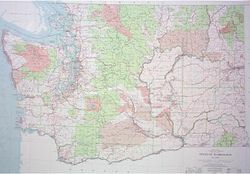 The USGS Washington State Base map show roads, railroads, rivers, county lines, national forests and parks, cities and towns. Washington is drawn at a scale of 1:500,000. The base map has no contour lines and the clean look serves well as a basic reference wall map. Last updated in 1982, but it is still a very useful wall map of Washington.